I know… it is a shock to you. But it is true. Back in the day, no-one could bake bread indoors so they had to make their dough at home, let it proof over night, then get up early to stand in line with the rest of Paris at a baker shop to wait while the bread was made. They did this every single day. Then it evolved to becoming a skilled dough maker AND baker, making it easier on everyone (except the baker!) Young kids started apprenticing with and/or without school just to be able to work a 16-hour a day, 6 day a week job. When the war years brought shortages of flour – they had to get creative and life without it was difficult to say the least. This was followed by recovery and commercially made products that gave hours back to the days of citizens and bakers. In fact, although we bemoan commercially made bread, yeast, etc. just how many of us are willing to go through this effort to source and make fresh dough, yeast, flour, etc? Not many. For modern day bakeries, buying pre-made product is easier because they know that skilled artisan bakers are hard to find, the products are labor-intensive (croissants can take anywhere from 20 hours to 3 days to make), the price of butter & milk has sky-rocketed, and most importantly if they did manage to find a skilled artisan baker but they were sick, who would replace them? But why waste time & money when there are some clues on the outside of the shop that will set your expectations before you even go inside the shop? I know it is difficult to get distracted by the pretty things in the window, but first look at the words on the awning instead… are you standing in front of a bakery (boulangerie), a baker (boulanger) or an artisan baker (artisan boulanger)? When you see bakery/boulangerie on the front of a shop it is quite vague in that it really tells us nothing other than that they are selling baked goods. Who made it? Where did it come from? We have no idea. This is where you’ll most likely find frozen product. When you see baker/boulanger … You will most likely find frozen or par-baked product here as well. I say it all the time, just because it says baker, doesn’t mean there is a maker. It only implies that someone is baking on-site… but not that someone is making the dough or sourcing the flour, butter, yeast, etc. and then physically combining the ingredients and then kneading it before it is baked. When you see artisan baker/artisan boulanger it is a big step up because these words tell us that there is a skilled/trained artisan sourcing ingredients and making the dough and baking it on premises, but even then, I question, are they using quality flour? Fresh yeast? Margarine or butter? 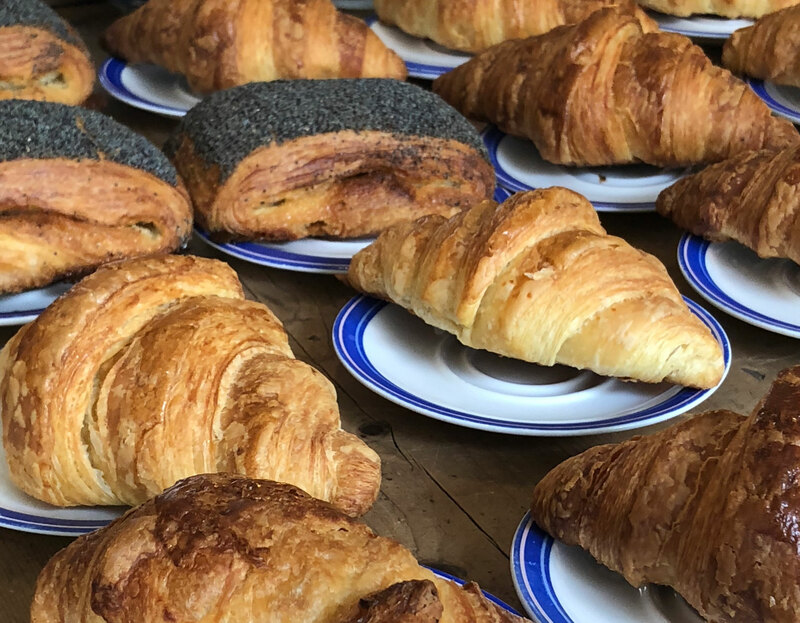 To get GREAT baked goods, I’ve done the leg work for you as a customer of these artisan bakers below who are sourcing quality ingredients, and making every product in house with love from start to finish. Le Petit Grain – Doughnuts stuffed to order! Like miso caramel doughnuts, Sugar & lemon curd, Peanut/marshmallow/salted butter caramel tarts, and multi-grain loaves of bread. 19th arr. Right bank. Poilane- for the open-face apple tarts & turnovers. 3rd (right) and 6th (left) arr. Ble Sucre- for the croissants & madeleines. 12th arr. Right Bank. Christophe Vasseur’s Du Pain et Des Idées – for the fig tart and pistachio-chocolate escargot buns probably the most Instagrammed in al of Paris). 10th arr, Right Bank. Claire Damon’s Des Gateaux et du Pain – for the lemon chausson and the Kouglof. 15th arr. Left Bank. On occasion you will see a shop with the words “boulangerie” in vintage glass panels but there is a modern awning that says “artisan baker”…. this is simply due to the fact that the artisan is keeping the historic facade.